You can see there's quite an improvement. Even though the Jan. 17th picture is more of a close up (it's hard to get a good shot between his front legs with a phone) it's obviously closing and not growing. Yeah! 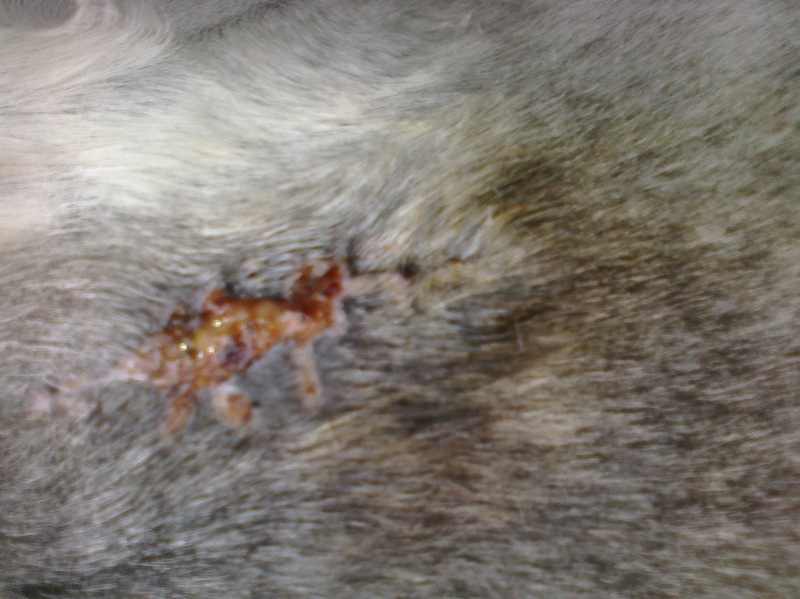 The vet saw him on Thur., took a sample to biopsy again and left me with cleansing solution and an antibiotic cortisone cream to apply twice daily. The wonderful young women working in the barn at Fraser Equestrian Center are playing a big part in his healing too. Rogo's stall has a thick bed of peat, then amazingly thick bed of straw, and they clean the wound and apply the ointment twice a day. Jessica even lent me her 'donut' (?) to put around his left hoof to keep it away from the wound. We aren't out of the woods, but the trees are thinning. This week I'll have lessons on a school horse and if things continue to improve with Rogo I'll be back on him in a week or two. A few days ago I wondered if I'd ever ride him again (the growth touches the girth area). Thanks for reading. More interesting posts to come soon I hope! I've just caught up by reading your last post too. This wound looks like it's healing well now. I'm sure with the wonderful care Rogo is getting it should be fine in a little while. I know how hard this must be for you and him. I hope it all goes well and heals soon. Good luck. Enjoy your lessons this week too. At least it is going in the right direction. Good news. It looks so much better....I hope it isn't bothering him at all and you can ride again soon. It looks so much better! I'm so happy to see this! Wounds are funny things, they can look absolutely terrible but then heal up fine. I'm sure Rogo will be back to work in no time! That looks so much better!! He is healing so quickly. I hope that it does really well so you guys can get back to riding. 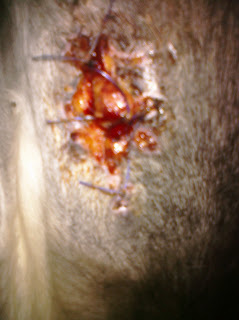 One of my trainer's horses cut his chest open in the most awkward place last year (he broke out of his field and crashed full speed into some no-climb fencing). A giant flap of skin fell off that couldn't be saved and he had a gaping wound that you could seriously fit a canteloupe inside...I was astounded at not only how it healed, but how quickly he was able to start work again. I hope you're riding soon! It does not look like the same wound, that's how much it has closed. Excellent care by all peeps concerned. Good news! I hope he stays on the mend! Carol, Oh, it looks so much better! I'm glad it is healing so well. I've been thinking about you and wondering how things went with the vet on Thursday, so I'm glad you've given an update. I hope Rogo is feeling better, and I'm so glad he has such great "nurses" helping him out and watching over him so carefully. It helps with your frame of mind as well. He is such a special horse!